What is Casino Video Poker? Why Full Pay Video Poker? Introduced to the gaming world in July 2009, Crown Europe Casino has become one of the highest rated online casinos out there as it offers its players amazing bonuses, fantastic and ever growing choices of games and an impressive Playtech powered platform in which to enjoy the high level of online gaming from. Crown Europe Casino hosts a wide choice of over 120 colourful and entertaining games to choose from, ranging from Card Games such as Blackjack, Baccarat and Craps, Arcade Games like Keno and Knockout and also Scratch Cards including Football Mania, Pharaoh’s Kingdom and Love Match. There are also Progressive Slots like The Incredible Hulk and X-Men and also new games are released on a monthly basis, maintaining a fresh and exciting choice of entertainment for players. There is also a choice of live dealer options for table games giving players the option to play against real dealers which is available 24/7. Crown Europe Casino is powered by the leading software provider, Playtech so it is no great surprise that the graphics and features are of the highest quality and service. The visual and graphic effects are impressive and dramatic, some of the Progressive Slot games even using in-game clips from the motion pictures which makes playing a sheer delight. The sound effects also add to the performance with realistic and dramatic sounds which are unique to each game, from the action packed Progressive Games to the casino dealer’s imitations in the Card and Table Games. The software can be downloaded in no time at all or is available with Flash Player for those who have it. 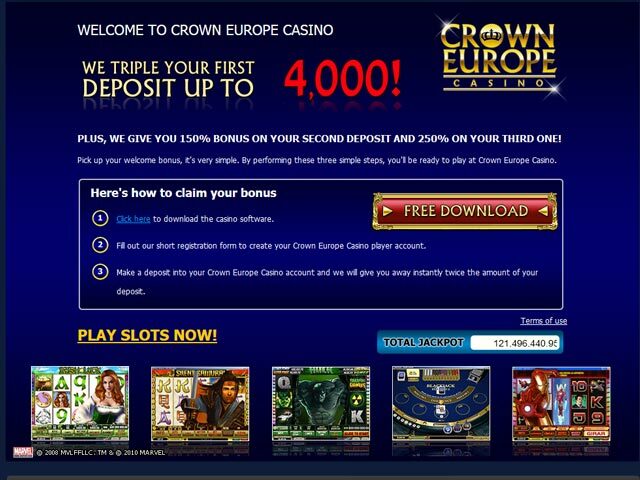 When it comes to great bonus offers, Crown Europe Casino really pulls out all the stops, making it very hard to for new players to resist the tempting benefits. When you first play at Crown Europe you are given the opportunity to earn up to $7,200 in bonuses! Players first deposit is rewarded with a 200% bonus (i.e. deposit $100, play with $300), their second with a 150% bonus (i.e. deposit $100, play with $250) and their third deposit with a humongous 250% bonus (i.e. deposit $100, play with $350). Following this, players receive weekly 100% bonuses for one entire year. That’s 52 weeks of weekly bonuses! And that’s just to say welcome! You cannot really get better than that. Crown Europe offers a huge range of payment method options so there is something to suit every need. You can choose from the standard Visa and Mastercard options and Crown Europe also offer a very attractive 10% bonus when you choose an alternative payment method to deposit with such as Click2pay, paysafecard or usemybank. Crown Europe offers nothing but the highest quality when it comes to Customer Support. They treat each customer with the utmost care and professionalism and really take the time to help as best as they can. The Customer Support Team is available 24/7 and can be reached on +632 756-7828 (International) or by email at support@citytowercasino.com.